Night of February 26 1942, Los Angeles. 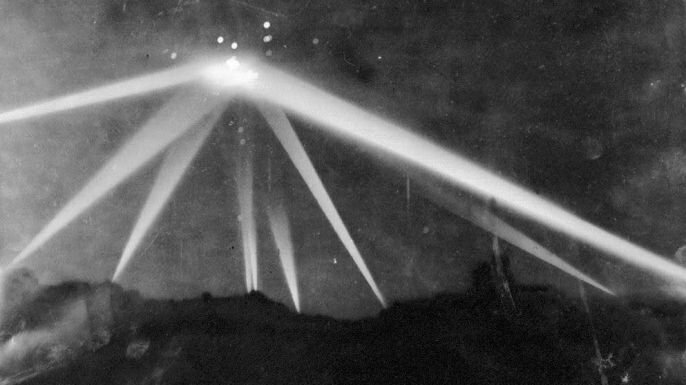 This photo, published on Feb 26 1942 by the Los Angeles Times, shows searchlights beaming at an unknown flying object during the Great Air Raid Of Los Angeles that took place on the night of Feb 24-25 1942. After the bombardment of Ellwood by the Japanese submarine I-17 on Feb 23, there was a wave of paranoia and nerves among the civilians and military personnel of the U.S. west coast. Everyone feared another attack would occur and on the evening of Feb 24, U.S. Navy intelligence warned military units of another Japanese attack was strongly possible. A little after 2 a.m. of that night, radar along the California coastline showed what appeared to be an enemy aircraft around 120 miles west of Los Angeles. Air raid sirens were quickly sounded and blackouts were ordered throughout Los Angeles County. Incredibly, it only took a few minutes for all the anti-aircraft guns and searchlights to be manned. With searchlights beams sweeping the night sky, the shooting began at 3:16 a.m. Starting first in Santa Monica, members of the 37th Coast Artillery Brigade, with 12.8-pound anti-aircraft and .50 calibers guns blazing, reported an unidentified flying object was passing overhead. In a short time, anti-aircraft batteries from all over the county joined in. There were reports of multiple aircraft flying in formation and even a claim of a Japanese plane crashing into a street in Hollywood. The shooting stopped at 4:14 a.m. and the "All Clear" was ordered and the blackout was lifted at 7:21 a.m. It was then the military realized there were no signs of aircraft or any kind of attack, no wrecks, no bomb craters. But several buildings and vehicles were damaged from the fragments of shells, which 1400 were fired. 3 people were killed in car related accidents during the air raid and 2 more died of heart attacks caused by the stress of the night long situation. The only evidence that any aircraft appeared was the one photo published by the Los Angeles Times, it didn't take long for the incident and photo to be front page news across the Pacific coast and even throughout the United States. Just hours after the air raid, Secretary of the Navy, Frank Knox, said the incident was false alarm caused by "war nerves." All planes in the area were grounded during the raid, and after the war, Japan claims no aircraft were sent over Los Angeles during the war. Many theories were made to explain this incident, such as; an extraterrestrial visitation, a meteorological balloon that got loose somewhere in the coastline, imagination and nerves and there's a claim that the photo was heavily edited before it was published. Which of these do you believe is true?